Located in San Francisco, artist Kimberly Austin creates beautifully crafted ephemera on her circa 1800s Chandler & Price letterpress. Inspired by a collection of rare books and alphabets, she designs lovely, quality stationary that is a delight to use, and can be cherished forever. Luxurious oval Letterpress Thank You cards. 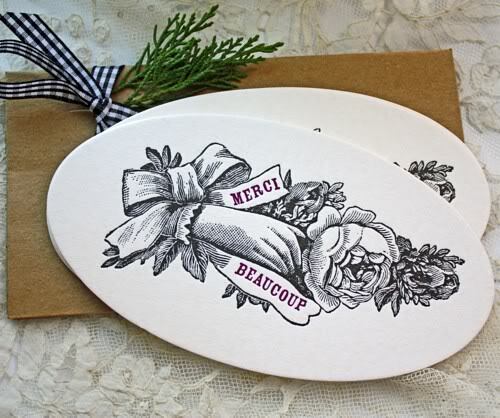 Just like antique Victorian cards, these have a lovely hand holding a rose bouquet. The perfect card to show your appreciation, these quality, heavy cards are imprinted with Black & Purple inks. Sold in a set of eight, each comes with a recycled kraft envelope. Each measures 3~1/4" x 6~1/4".